Originally uploaded by tokyo ayano. Rick Stein is the first TV chef everyone in England thinks of when it comes to seafood. I watched “Rick Stein and the Japanese Ambassador” on BBC2 last night. 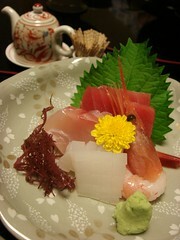 It was one of the best recent programmes about Japanese food, particularly seafood, which I love. I really enjoyed it. When the Japanese Ambassador saw Rick preparing sushi onboard a boat off Cornwall, he was not terribly impressed. However, this sparked off an idea where Rick would go on a voyage of discovery to the ultimate seafood lovers destination – Japan. On his return he promises to create a banquet fit for an Ambassador and his friends. The Guardian has an article on the programme. The first half of the programme was his journey of discovery in the land of seafood heaven, Japan. First, he tried an izakaya, which he described as Japanese tapas bar. He was impressed by the quality of the food and excellent Japanese beers. It brought back my old days in Japan straight away. Next morning, he went to the Tsukiji fish market and had a sushi at a restaurant near the market. There are many seafood restaurants around the market serving fresh seafood directly from the market at reasonable price. I have been there a few times and I would like to go back again when I get a chance. He also had a grand meal at Asadaya, one of top Japanese-style restaurants, in Kanazawa which is well-known throughout Japan for its traditional cuisine. He praised that the meal was much better than those at michelin starred restaurants. Of course it is! Back in London, he created an eight-course banquet at the Japanese embassy, but he had to ask the two embassy chefs for help. He was very impressed by their skills. The way the chef cut a fish is simply an art show. I would like to try one of his restaurants in Padstow, Cornwall one day. He has a lovely dog called Chalky.